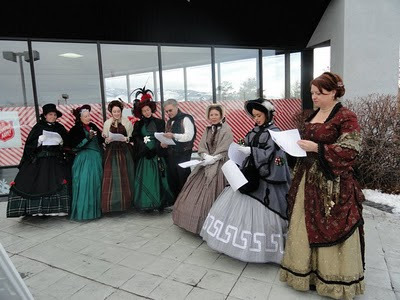 Yesterday, a group of us from the GBCS went caroling at the Salvation Army Toy Shop in Reno, NV. We were dressed in our Dickens finest and made some people smile as they were waiting in line. As usual, click on the link here or on the picture below to see more pictures. I also spent some time today updating this blog and the links, etc. I hope it is now a bit more user friendly. Oh, and on Sunday, I was paid a deposit to start on a Cinderella dress for a customer. It's going to be fun! We got back yesterday from a wonderful weekend in San Francisco attending the Dickens Fair. You can read all about it and see lots of pictures by clicking HERE or on the picture below. 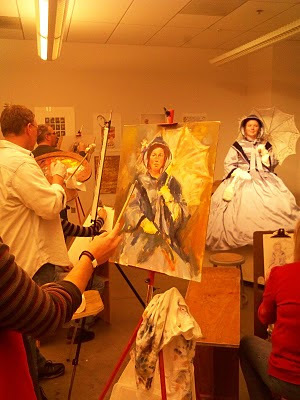 Yesterday, I went and sat in costume for a portrait panting class at the Nevada Museum of Art. It was painful to sit that still for three hours with only a few minute breaks here and there. But it was a wonderful experience. To see more pictures, you can click on this link or on the picture below. And I finally got the link up for the page highlighting our trip ti the Valhalla Renaissance Faire. Click on the link or the picture to see more pictures. The weekend after Valhalla, we went back up to Lake Tahoe for a Victorian event, Mark Twain Days. We also stopped off in Carson City for their Rendezvous. Again, to see more pictures, you can click on this link or on the picture. I have several costumes commissioned which I will be working on in the next couple of months, so it's going to be lots of fun. 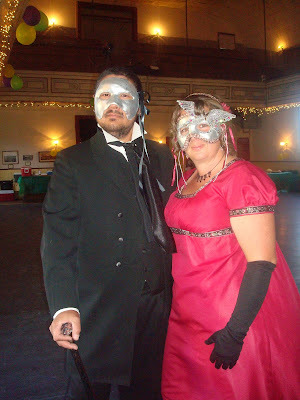 In July, we went back up to Piper's Opera House in Virginia City for their Summer Masquerade. In October, we again went to Piper's for their annual Governor's Ball. 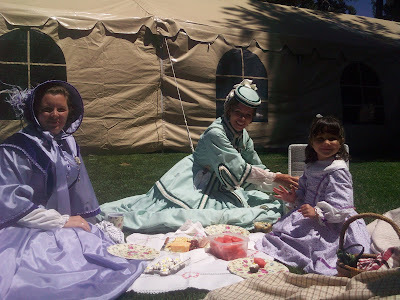 At the beginning of November, our church hosted a Victorian Tea. That brings us up the the present. In about a month, a group of us are headed over to the San Francisco Dickens Fair. And I have a hankering to make a new outfit or two (or ten) for myself. So I'll try to be more diligent about posting. Yesteryear had a booth at the second annual Girl Scouts Uniquely Me fair here in Reno today. We took our outfits and accessories and dressed up the Girl Scout girls as they came by the booth. Check out all the pictures by following this link or by clicking on the picture below. 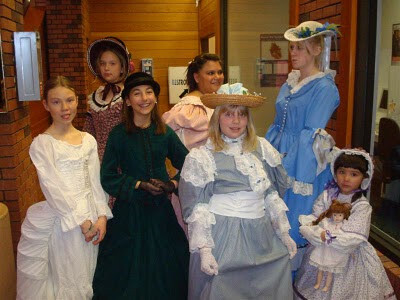 These are the girls who were in our fashion show. Four of them were fair attendees whom we asked to help out. They loved it. 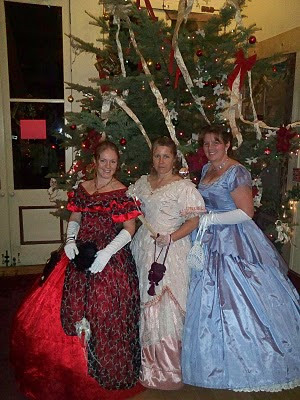 I cannot believe I didn't post about the Dickens Faire and Ball we went to in December. It was held at Virginia City, NV. Click HERE or on the picture below to read all about it and to see the photos. 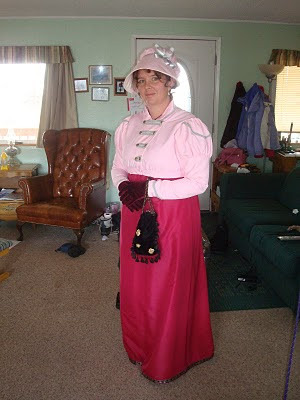 Also, to see the event to which I wore my Jane Austen outfit on January 31st, click HERE or click on the photo below. 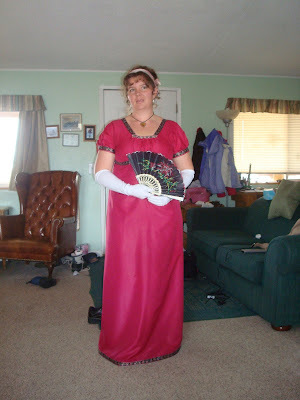 I completed my Jane Austen ensemble last night. Below are some pictures of the outfit. My mom and I are headed over to the Bay Area tomorrow for a social. I'll post pics of the event next week. Here's the spencer and bonnet I just completed. I think they look smashing together. And of course, the back of the outfit. Sewing completely for myself for the first time in over a year. (I made a dress for myself in December, but it was b/c I was in a friend's wedding.) 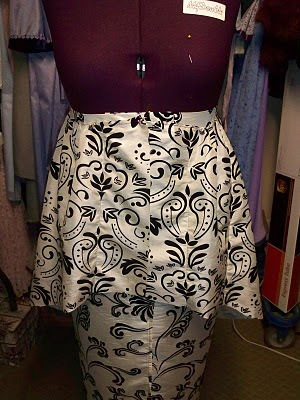 So, it was fun to spend the last two days sewing, but not on a customer's outfit. 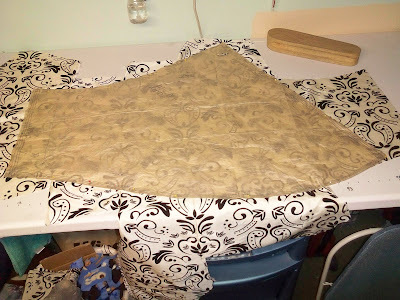 I am making a "spencer" for my Regency/Jane Austen dress. It is just about done. I'm loving it so far. I debated about the color for a while. 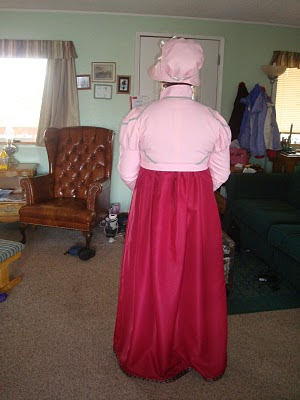 The dress is raspberry red with a black and pink trim. Should I go with a black spencer or some other color? Well, it came down to economy. I did not have black material, but in my stash, I found some pink material that goes very well with the raspberry. But did they make spencers out of pink material? After some careful research I learned that they made them out of every color. So, I went with what I had. 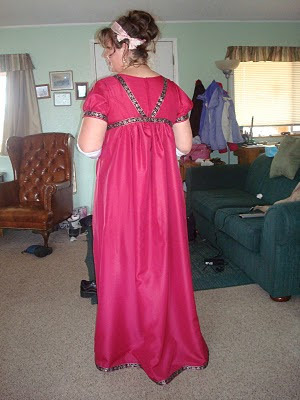 Besides, it will be more fun to coordinate that to a new dress I'm bound to make :) And the trim may not be exactly period correct, but again, I went with what I had. I'll post pics when I get it finished. Progress after a setback. I made a rookie mistake today. One that makes me glad I am not paid by the hour. 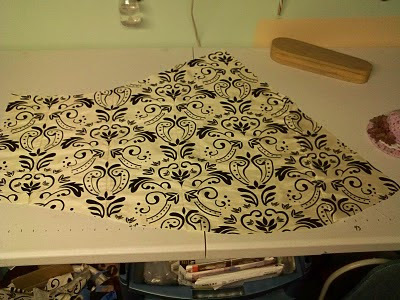 I cut out a rather large pattern piece the wrong way and did not have enough fabric left over to cut it out the correct way. 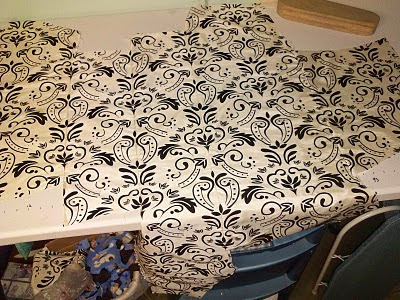 And, not wanting to cost the customer any more money by buying more material, I decided to try to piece together enough fabric scraps to make up the piece I needed. It took 5 scraps to get a piece large enough. I think it turned out rather well, all things considered. See the pics below to see the steps I took. 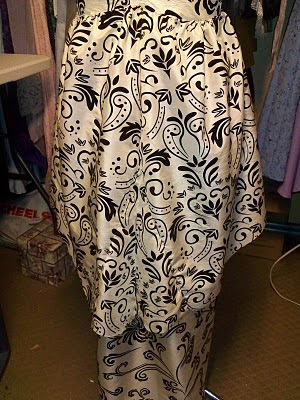 By the way, this is the overskirt which goes with bodice "C" on the pattern I posted the other day. Step 1: matching up the material pattern and sewing the pieces together. Doing all the matching was the longest part. Step 2: Whew! The pattern barely fits. Since the material design is a one way design, the pattern piece had to go just so. Step 4: testing the look (this will be attached to the bodice eventually). Step 4 again, just on the back. You can see the "wedge" near the bottom. Can you tell which side of the wedge is the pieced together part and which is the faux seam? And, after making sure the overskirt was going to work right, I put it aside and went back to work on the "A" bodice. It's looking pretty good so far. Christmas and the Holidays are over, it's time to get back in the Sewing room. I have another outfit commissioned by the same customer I've been making dresses for. In fact, it is the same pattern I've used twice before (the purple and teal Titanic-era dresses). 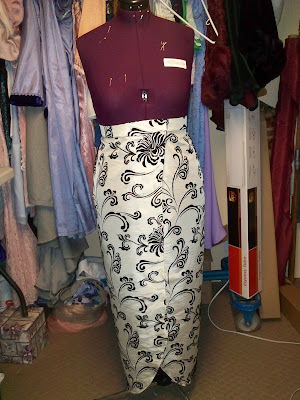 I did the skirt today, just need to put the hooks on when I do the final fitting. I posted a picture of the pattern I'm using since this will be the third time I've used it. 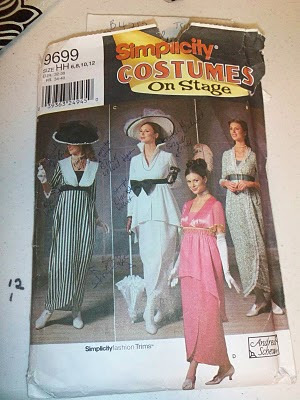 This time around, I am doing dress A (left) and dress C (middle) in a cream with black velvet floral patterned fabric. I'll post more as I get it done. Simplicity pattern for fairly accurate Titanic-era dresses. The main alterations I made to the pattern is to make them two-piece and to make the bodices front hook closures instead of rear zip closure. 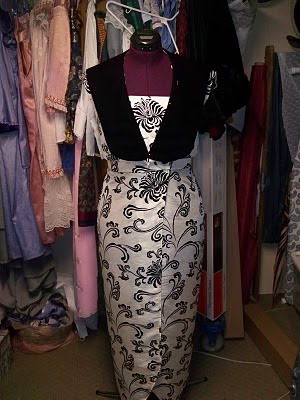 The nearly finished skirt of the newest Titanic-era dress.